Next week JD and I go to New Orleans to celebrate the end of the bar exam and our anniversary, which was earlier in the month. This week I started thinking about what to pack for the trip. I'm pretty sure that it's going to be very hot and that we will be doing a lot of walking so light fabrics and comfortable shoes will be key. I adore the bright poppy red color of this skirt from J. Crew, it has my name written all over it. And this silk top from Joie is so feminine and sweet. I love the draping of the sleeves. I would pair them with a simple belt, cross-body bag for hands free sightseeing, and simple go with anything sandals. I love this look... that red skirt! 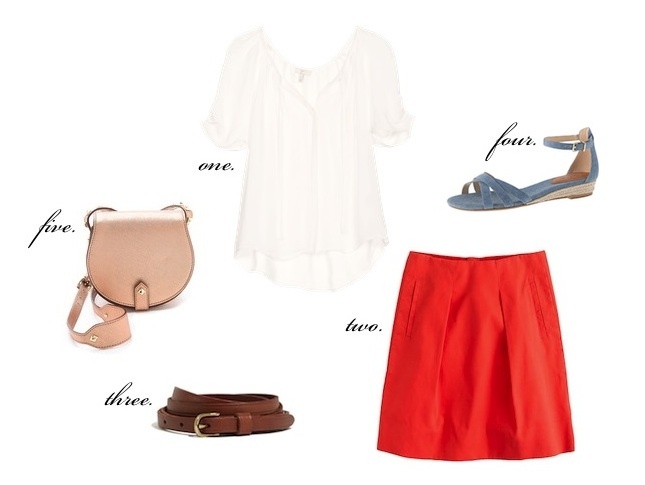 Very sweet and girly and perfect for sightseeing! Flats are essential for walking while sightseeing!